1. For the relish, put the almonds, garlic, coriander and lime into a food processor, then season. Whizz while gradually adding the olive oil. Stir in the feta and the chillies. Taste for seasoning. 2. To cook the fish, melt the butter in a large frying pan and add the oil. Season the salmon on both sides and cook over a medium heat, skin-side down, for about 2 minutes or until the skin is golden. Turn the fillets over and cook for a further 2 minutes. 3. Reduce the heat, cover the pan and leave the salmon until it is cooked through but still moist. How long this takes depends on the thickness of the fillets, about 5 minutes. 4. 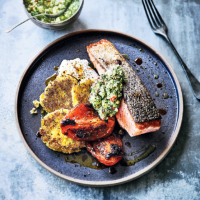 Serve the salmon with some of the relish spooned alongside on the plate and the corn cakes with chilli-roast tomatoes.